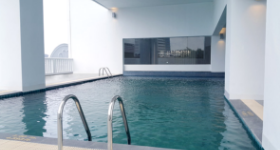 Superior Room for THB 3,200 / net. Superior room for THB 2,500 / net. • Standard meeting room setup—audio-visual system, standard stage backdrop, Wi-Fi internet, LCD projector, car parking and venue rental fees. • 1 complimentary upgrade for an Executive Room. • Groups of 100 guests will receive either a complimentary barrel of local beer, a karaoke setup or a welcome backdrop for the registration area. As one of the world’s most visited countries, Thailand welcomed more than 38 million arrivals in 2018, with a staggering 1.25 million of them belonging to the business travellers sector. This substantial number alludes to the nation’s growing popularity as a hub for MICE events—also known as meetings, incentives, conventions and exhibitions. There are many reasons Thailand has become such a popular destination for events. 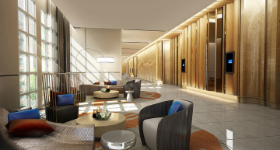 First, its location at the heart of the Southeast Asian region has allowed the country to flourish as a prime business destination for neighbouring nations. This coupled with the country’s ever-evolving transport routes, stunning and diverse natural landscapes that range from cities to beaches, and world-famous hospitality have also played major roles in transforming the country into a leading destination for all types of events. Despite the majority of functions taking place in the capital city of Bangkok, both local and international organisers have also turned their attention to the picturesque island of Phuket as a setting for memorable get-togethers due to the availability of flights, its scenery that range from lush cliffs to white sand beaches, as well as its rich cultural heritage that comes to life through Phuket Town’s unique Sino-Portuguese-inspired architecture, colourful murals, and graffiti art on show. As the country’s largest island there is something for everyone here. 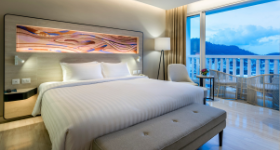 Over the years, Phuket has become one of Thailand’s most popular MICE destinations, resulting in the establishment of over 500 hotels covering all budgets, each complete with meeting spaces that are fully-equipped with the latest in audio-visual technology. The island also boasts a wide-range of largescale venues, outdoor and indoor activities, and attractions to guarantee fun and inspiring team-building trips and corporate events, as well as calming scenery to help participants unwind once the day is over. At Novotel, we want to offer both organisers and participants a seamless and memorable experience from beginning to end. Our modern hotel houses a 935sqm Grand Ballroom complete with vaulted ceilings and state-of-the-art amenities that can accommodate up to 700 guests, as well as two smaller multi-purpose ballrooms that are each approximately 500sqm. 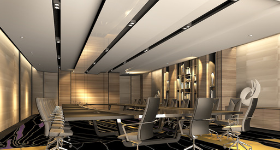 Moreover, for more intimate events, opt for one of four meeting rooms that range from 54sqm to 235sqm in size. And in order to ensure easy access, both organisers and participants will also benefit from the hotel’s complimentary car and motorbike parking areas. 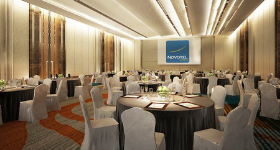 Other factors that will help promise a successful event include Novotel’s ProAct: a comprehensive and effective service that will let you tap into the hotel’s designated WebCorner and network, infrastructure, specially adapted facilities and efficient logistics to ensure nothing is left to the last minute. Our talented event planners and personalised concierge service are also more than capable of providing a customised solution that suits your unique vision. In addition to diverse meeting facilities, the hotel’s stylish guestrooms will provide the perfect sanctuary for your participants and/or guests. They can also indulge at any of the three restaurants and bars covering Amor—for cuisines ranging from local to international served in either a la carte or buffet style; Lua Lobby Bar—a contemporary venue for evening cocktails; and Estrela Sky Lounge—offering light bites and an array of alcoholic and non-alcoholic refreshments. MICE participants are also encouraged to take advantage of the various facilities available to them, which include an outdoor pool that is conveniently located on the third floor with views of the surrounding town, as well as the 24 hour InBalance Fitness by Novotel, and InBalance Spa by Novotel that offers a comprehensive menu of wellness treatments that any discerning guest can enjoy before or after their busy schedules.